The Prostamex™ Gold formulation includes a broad spectrum of essential nutrients and botanical extracts that have been expertly combined to support the health of a man, helping to maintain general health and wellbeing, as well as also reproductive function. Prostamex™ Gold provides beneficial levels of vitamins A, C and E. Vitamin A and C work to maintain the strength of the immune system, but also have other important roles in the body. 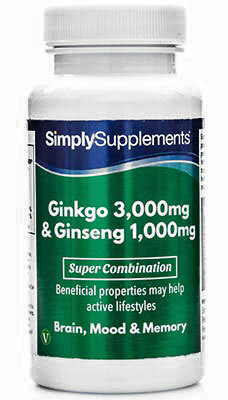 It also makes a significant contribution to a man’s overall intake of zinc and chromium. Vitamin A contributes to the maintenance of normal skin and mucus membranes, and supports the maintenance of normal vision. Vitamin C contributes to the maintenance of normal blood vessel function, and has an essential role in energy yielding metabolism. Vitamin E functions as an antioxidant, and helps to protect DNA, protein and lipids from oxidative damage caused by free radicals. Zinc contributes to normal fertility and reproduction, and supports the maintenance of normal testosterone levels. Similarly, zinc contributes to normal protein synthesis, the body’s process of building muscle. Chromium contributes to normal macronutrient metabolism, and has a role in maintaining normal blood sugar levels. Prostamex™ Gold also includes the amino acids beta alanine, L-lysine, L-methionine, L-glutamine and L-arginine. 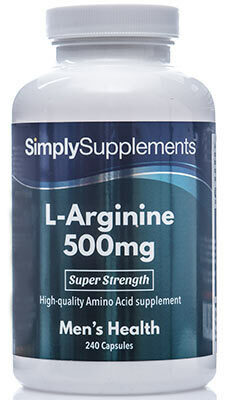 Amino acids are the building blocks of protein and play an essential role in the growth and maintenance of muscles. As men age, muscle mass naturally declines and a regular supply of amino acids become even more important to help prevent muscle deterioration. Included as part of the overall ProstamexTM Gold formula are a range of high-quality botanical extracts. These include pumpkin seed extract, dandelion root extract and a combination of both Siberian and Korean ginseng extracts to provide natural support. All of these beneficial health claims are supported and approved by the European Food Safety Authority (EFSA). 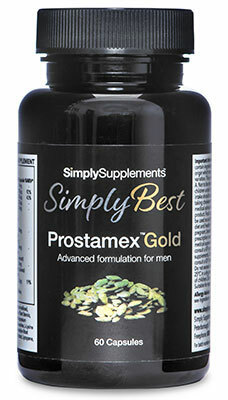 As part of the Simply Supplements SimplyBest range, ProstamexTM Gold offers unprecedented standards of quality. 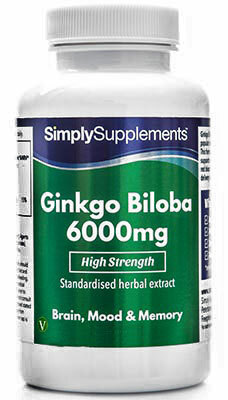 Only the highest-grade active ingredients have been combined to offer a convenient men’s daily supplement, which has proven to be extremely popular with our customer base. 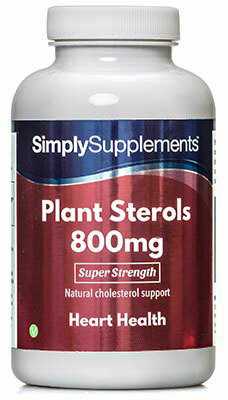 Simply Supplements are committed to maintaining standards of quality excellence that position us as market leaders. Stringent quality control points, and audit trails that are traceable from the check weighing of the final tablets, all the way to the sourcing of the raw ingredients, allow us to keep ahead of our competition. 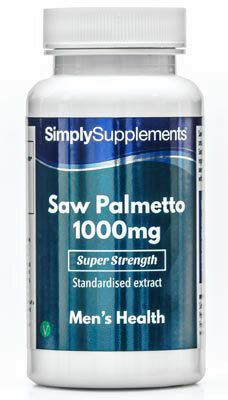 All Simply Supplements products are manufactures in the UK to the high standards of Good Manufacturing Practice (GMP). Ingredients: Bulking Agents (Dicalcium Phosphate, Microcrystalline Cellulose), Vitamin C (as Ascorbic Acid), Zinc Citrate, Glazing Agents (Hypromellose, Glycerin, Hydroxypropylcellulose), Vitamin E (DL-Alpha-Tocopherol Acetate), Soya Isoflavones, Plant Sterols, Brewers Yeast, Grape Seed Extract, L-Arginine HCl, Flaxseed Oil Powder, Beta Alanine, L-Methionine, L-Lysine Monohydrochloride, L-Glutamine, Anti-Caking Agent (Magnesium Stearate), Copper Gluconate, Lycopene, Vitamin A (Retinyl Acetate), Dandelion Root Extract, Pumpkin Seed Extract, Siberian Ginseng, Korean Ginseng, Chromium Picolinate. This product contains vitamin A. Do not take if you are pregnant or likely to become pregnant except on the advice of a doctor or antenatal clinic.If you are taking any prescription medication, you have a medical condition or you have specific concerns about the suitability of any of our products in relation to these, you should always consult your GP or Pharmacist prior to taking supplements. Pregnant or lactating women should consult a GP before taking supplements. Do not exceed the recommended daily dosage. Keep out of reach of children. Supplements should not be taken as a substitute for a varied diet. Always read the label before use.